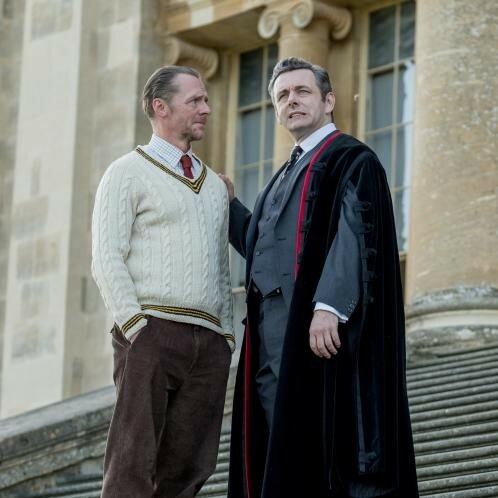 After decades of Hollywood hell Henry Fitzherbert’s school horror Slaughterhouse Rulez is finally released. It’s normally my children who get overexcited at Hallowe’en. This year I’ll be the one unable to sleep as Slaughterhouse Rulez, a comedy-horror that I co-wrote, opens in 500 cinemas nationwide. The first film from Simon Pegg and Nick Frost’s new production company, Stolen Picture, the public school-set movie stars Finn Cole and Asa Butterfield alongside Pegg, Frost and Michael Sheen. The inspiration of the film’s co-writer and director Crispian Mills, it is — if I may slip into my former profession of film critic — a delirious blend of teenage comedy and school survival story with nods to British favourites such as Lindsay Anderson’s if . . . ., St Trinian’s and Shaun of the Dead (five stars, obviously). Looking at me through narrowed eyes, he replied: “I’m staying at the Savoy. Get it to my suite by six in the morning and I’ll read it on the plane home.” I dashed home and drunkenly printed out 100-odd pages of amateur screenplay, jumped on a night bus to the Savoy and handed it to the concierge. Two weeks later my phone rang. “Harvey loves your screenplay,” drawled a voice from Weinstein’s New York office. Shortly after that I was sitting opposite his London associate, Trea Hoving, being given notes. Blimey, I thought, getting a film made isn’t nearly as hard as people say. Little did I know it would be 18 years before that would happen, precisely 20 years since I started writing screenplays. Once I got there, though, beating Slaughterhouse into production by a few weeks was another film that I had written, the historical drama Born a King. A true story about Prince Faisal al Saud who in 1919, aged 14, was dispatched from the deserts of Arabia to London on a high-stakes diplomatic mission, it stars Deadpool’s Ed Skrein (as Harry St John Philby, the father of the spy Kim), Hermione Corfield, Laurence Fox and Kenneth Cranham. By some miracle, after two decades of near-misses and despair, I was being rewarded in spectacular fashion, but at what cost? After all, I had sacrificed conventional career progression to the insane gamble of trying to make it in movies, putting my marriage under strain while living under the dark cloud of failure; would I ever make it? Even worse than the prospect of never achieving my goal was the crushing self-doubt that made me think: “Do I even deserve to make it?” Did I simply not have the ability, let alone the luck, to break through? The excitement of a new idea would fire me up, however, and I’d be back at my keyboard, racing through a screenplay. I wrote a wedding comedy, Wedlocked, and was astonished to receive an offer of £17,000 in upfront fees by a production company, Material Entertainment. It loved the story of two girlfriends whose wedding dates clash. Alas, I wasn’t the only one to have it. Two days after the contract arrived on the desk of my newly acquired agent, the trade journal Variety announced a Hollywood movie based on exactly the same idea. Bride Wars was going to star Anne Hathaway and Kate Hudson. The contract was never signed. I was plunged into despair, but soon afterwards another of my screenplays was bought by Elton John and David Furnish’s company Rocket Pictures, the romantic comedy Secret Mum. What could go wrong this time? It would be my first taste of “development hell”. Over two years of painful rewriting I made a complete hash of the script while Rocket gradually switched focus to animated fare such as Gnomeo & Juliet. Would I have better luck in Los Angeles? With my wife weeks away from expecting our first child, I spent money I didn’t have on a trip to Los Angeles at the behest of a management company, Underground Films, which had taken an interest in me. Underground’s co-founder is one Trevor Engelson, better known now as the first husband of the Duchess of Sussex. A super-hungry, hardworking New Yorker, he spoke to me while pounding a basketball between his legs and conducting a simultaneous phone call via a headset. “Whaddya got, Henry? Pitch me,” he said. My suggestion of a body-swap comedy set in the home counties went down like a lead balloon. I ended the week with a friend in Las Vegas feeling like a total loser. Then came what I felt sure would be my big break: David Frost optioned the remarkable life story of Sammy Gitau, a reformed gangster from a notorious Nairobi slum, who made headlines when he graduated from Manchester University with a master’s degree after finding a university prospectus on a rubbish tip. Frost agreed to let me write the screenplay and this inspirational project became my obsession (and still is). With all my other movie irons in the fire fizzling out, I lived for my regular meetings with Frost. “I’m off to America on Friday to interview George Bush Sr, but we’ll meet next week. God bless,” he might say, while showing me to the lift. I always left his office floating on air, convinced that we would shortly be in production. When he died in 2013 the country lost a national treasure and I lost a mentor who had been unwaveringly supportive and kind. My dreams were over. Then in 2015 the project that had left me standing at the altar, Wedlocked, caused me to cross paths with the film-maker Crispian Mills, the son of the actress Hayley Mills. He took an interest in reviving the project, but our attention soon turned instead to a script he had begun that was set in an English boarding school where a fracking-induced sinkhole unleashes hell. So much of life is meeting the right people at the right time. Suddenly, years of lonely frustration and hard-won experience clicked into a hugely rewarding writing partnership and friendship. If I hadn’t fully appreciated it before, I certainly did now: good scripts aren’t written, they are rewritten. Relentlessly. Crispian showed an early draft of Slaughterhouse to Simon Pegg. 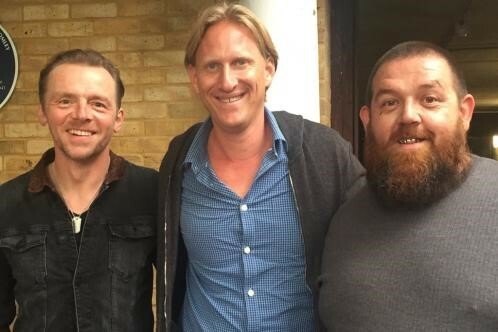 Again, luck and timing were all — Simon revealed that he and Nick Frost were in the process of setting up a production company and they felt that the film could be a good first project. As Slaughterhouse Rulez and Born a King edged agonisingly closer to production (I was commissioned to write the latter by the Oscar-winning Spanish producer Andrés Vicente Gómez), my luck in journalism finally ran out: I was given a month’s notice to leave the newspaper. This time, though, at last the movie gods were looking out for me. In the same hour that I was in my final press screening after 20 years of reviewing, the director Agusti Villaronga was calling “action” on the first shot of the first day of my first film, Born a King, with a cast and crew of 200. I left the screening room and took a train to the set at Hatfield House in Hertfordshire. That same afternoon, Slaughterhouse Rulez was officially announced. If it happened in the movies, you would never believe it. Of course, all movies have a message, so what’s mine? It would have to be this: keep writing, keep writing, keep writing. The next script could be the one.